The audio recording of my August 18 lecture at the Commonwealth Club of California is now available. Listen to it on the Commonwealth Club’s website. The concept of homophobia – a word first coined in the 1960s – has played an important role in shifting society’s focus onto the problem of prejudice against people who aren’t heterosexual. But the word homophobia conveys a variety of assumptions that can actually limit our thinking. Drawing from social science research findings, including his own studies over the past 30 years, Prof. Herek will explain the value of looking beyond the usual conceptions of homophobia to develop a better understanding of stigma, discrimination and prejudice against sexual minorities, and to formulate effective strategies for changing attitudes. This program is part of the 2014 Platforum series The LGBT Journey, sponsored by Ernst & Young. “Beyond Homophobia” has been on extended hiatus but I’m hoping to resume it in the coming months. Meanwhile, I’ll be posting brief entries and announcements from time to time. President Obama is under increasing pressure to begin dismantling the military’s “Don’t Ask, Don’t Tell” policy. And Wednesday, the Center for American Progress issued a five-step plan for repealing DADT that begins with an executive order suspending discharges. What would be the political costs for the President and Congress of eliminating DADT? In terms of public approval, not much. In fact, repealing the policy might score points with voters. Poll data indicate that opposition to DADT has been steadily increasing in the years since it was first enacted, and that Americans now solidly support getting rid of it. By 1994, however, after DADT had been enacted, public opinion again began to shift and a growing majority wanted to allow openly gay people to serve. As shown in the graph, this trend has continued to the present day. In the most recent poll – conducted last month by Gallup – 69% favored allowing openly gay people to serve. Only 26% were opposed. This graph only includes polls that asked “Do you favor or oppose allowing openly gay men and lesbian women to serve in the military?” (or used similar wording). Other surveys that asked the question in different ways have obtained similar results. In some surveys over the years, for example, the question about military service has been posed in terms of equal employment opportunities. With the question framed this way, the public has been even more likely to endorse military service by gay and lesbian personnel. As early as 1977, 51% of Gallup respondents said gay people “should be hired” for the armed forces, and that majority grew steadily over time. By 2005 (the last instance I could find when this question was posed in a national poll), 79% favored having the armed forces “hire” gay men and lesbians, while only 19% opposed it. Other surveys have asked respondents to select from among three options: (a) allowing gay men and lesbians to serve openly, (b) allowing them to serve but without openly acknowledging their sexual orientation (the DADT approach), or (c) banning them entirely from military service. Over the past 15 years, relatively few respondents have advocated completely banning gay people from the military – never more than roughly 1 in 5. In July, 2007 (the most recent poll that asked this version of the question), only 15% said they wanted a total ban on gay personnel. In that same poll, 36% endorsed the DADT approach, whereas a plurality of 46% favored allowing gay people to serve openly. Compared to a similar poll in 2000, the 2007 results represented an increase of 6 points in favor of openly gay personnel, and a decrease of 7 points in support of a total ban. Thus, regardless of how the question is asked, the long-term trend has been toward increasing support for openly gay service members. 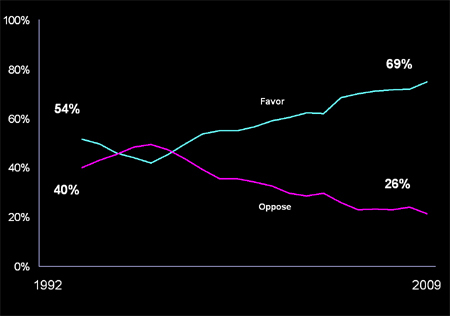 Americans also have grown skeptical of the main rationale that has been offered for retaining DADT. In a 1993 Gallup/CNN/USA Today poll conducted shortly after Bill Clinton’s inauguration, 51% agreed that “admitting gays to the military would undermine discipline and morale” (46% disagreed). But in a Quinnipiac University national poll this April, 58% disagreed that “allowing openly gay men and women to serve in the military would be divisive for the troops and hurt their ability to fight effectively.” In that same poll, a solid 56% favored repealing DADT whereas only 37% said it shouldn’t be repealed. A striking feature of the May 2009 Gallup poll is the breadth of support it reveals for a new military policy. Not surprisingly, self-described liberals are almost unanimous in supporting a nondiscriminatory policy (86%). But a solid majority of conservatives — 58% — also support openly gay and lesbian service members, as do 58% of Republicans and 60% of those who attend religious services weekly. Support has increased substantially in these groups since Gallup asked the same question in 2004 — by 6 points among Republicans, 11 points among regular churchgoers, and 12 points among conservatives. Support is even higher among Democrats, Independents, and the less religious. And openly gay service members have solid support among both men and women, in all regions of the US (including 57% in the South), and in all age groups (even among those who are over 65, of whom 60% support a new policy). This is a policy area in which the public is ahead of Congress and the President. There will certainly be an outcry from some far Right groups when President Obama suspends DADT and Congress overturns it permanently. In contrast to 1993, however, there appears to be a solid base of public support for a new policy that allows lesbian and gay Americans to serve their country without having to lie about who they are. A slightly different version of this post appears on the Palm Center’s blog, Blueprints.